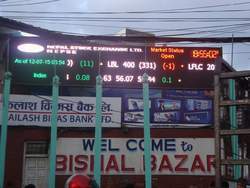 Manufacturer & Exporter of Electronics LED Screen for Stock Exchange. Our product range also comprises of LED Video Display, LCD Video Wall and LED Display. With the help of our distinguished professionals, we have been able to bring forth Electronics LED Screen for Stock Exchange. Manufactured using quality components and spare parts, these LED screens are designed in accordance with international quality standards and norms. Also, these products can be customized as per the specifications laid down by our esteemed patrons. Looking for Electronics LED Screen for Stock Exchange ?